We are looking for volunteers to join us, for painting, cleaning and gardening to spruce up our neighbourhood! We meet outside the Newtown Mall, 195 Riddiford St, between 9am and 12noon – wear your old clothes. all equipment is provided. Volunteers get free BBQ sausages, thanks to Newtown New World – and we sell sausages too, so you are welcome to come by just to say “hello” and get a sausage! KNC is supported by Newtown Residents’ Association, Amadeus Hair Salon, Wellington City Council, SB Maintenance, and Newtown New World. 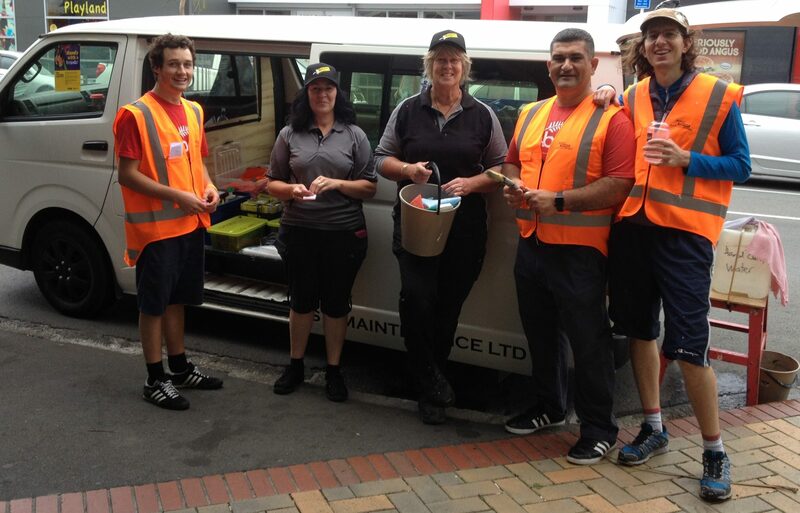 Keep Newtown Clean was started by David Wilcock from Amadeus, on behalf of the Newtown Business Association, back in July 2013. Its main focus was painting out graffiti, which was particularly bad back then. WCC and their graffiti management contractor SB Maintenance helped, and still do, by coming along, identifying areas that need attention, and providing gloves, cleaning products, paint and all the necessary equipment. It was a monthly event till early last year, but there was less graffiti to worry about and fewer volunteers were turning up so it was reconfigured as a quarterly event instead. The Residents’ Association were asked to take it over, which we did. What we have been doing in the past year is still cleaning off or painting out graffiti if there is any, picking up rubbish, cleaning off old tattered posters from lamp posts etc, and doing some weeding. Last September we offered to weed the courtyard garden at St Thomas’s, which was completely overgrown. Since then a group from the Residents’ Association and St Thomas’s have been continuing to try and develop the garden there, and we are about to do quite a major piece of work clearing, replenishing the soil and planting, so that will be something we will hope volunteers will help with on the 4th.